Airborne-based fire detection is a surveillance system for fire detection based on aerial imaging. Airborne systems are used in a wide range of scenarios, flying at low and high altitudes and speeds; for fire detection and prevention scenarios and with a broad selection of sensors on board. Airborne systems are considered as a compromise between ground-based and satellite-based systems as they are flexible, maneuverable, and deployable to target priority areas (Allison et al. 2016). Airborne sensor platforms are classified into different categories, depending on the characteristics of the carrier vehicle: they space from manned system (piloted aircrafts) to unmanned vehicles or drones, controlled remotely from the ground or operate semiautomatically. Active fire zone and surveillance areas can be scanned and monitored via an aircraft, flying at operational level at high altitude or at low altitude below the clouds level, with nadir-or oblique-mounted sensors, depending on operational requirements (O’Brien et al. 2015). Regarding the sensors, airborne platforms are equipped with both active and passive sensors. Typically used active sensors are Synthetic Aperture Radar (SAR) and Light Detection and Ranging (LIDAR). Visible-range sensors, infrared sensors, and thermal cameras are common passive sensors. A combination of spectral ranges can also be used as in multi- and hyperspectral cameras. Manned platform systems are capable of large-scale fire detection and long operation missions. Aircraft are widely used for wildfire detections with the advantage of being maneuverable and deployable to priority areas. Piloted aircraft are commonly manned by a pilot and may differ in fixed-wing and rotary-wing aircraft. While fixed-wing aircraft can fly at higher altitude and are more economical with higher payload capacities, the rotary-wing aircraft are more maneuverable and can land and take off in different environments (Allison et al. 2016). In comparison to manned vehicles, Unmanned Aerial Systems (UAS) do not have pilots and are able to cover small to medium regions, but provide low risk platforms for the operators, especially when used in dangerous situations. UAS are flexible, can reach inaccessible locations, and can target different areas. During the early stage of a fire, these devices can be placed rapidly near the fire source, flying over the burning areas and collecting data to build an active fire propagation map in real time. In searching for a fire event by looking at flames, the temperature-dependent radiated heat is the major signal for detection. Emissions of flame as hot spot and its radiation peak have been investigated in many research studies. The radiance is not uniform across wavelength, and, at lower temperatures, it has its peak emission in the Thermal Infrared Region (TIR, defined as the range around 8–15 μm). The peak is shifted to Mid-Wave Infrared (MWIR, around 3–5 μm), at higher temperatures (Allison et al. 2016). Furthermore, Long-Wave Infrared spectrum (LWIR) is sensitive to emitted radiations of heated surfaces by fire and is used widely for fire effects research (O’Brien et al. 2015). Most fire detection sensors operate in MWIR and TIR spectral range to detect hot spot and collects thermal and spectral information of the risk area. Thermal sensing can be used also for night-time imaging since the emitted energy is detected rather than the reflected one. However, combining more spectral bands resolves the problem of ambiguity in term of detection and reduces the number of false positives. A variety of IR line scanners have been developed using multiple spectral bands. Current sensors are Phoenix and the autonomous modular sensor (AMS), used in the US Forest Service and NASA. Phoenix consists of two line scanner systems and has been developed for the airborne thermal infrared imaging for wildland fire detection. The sensor with its data telemetry system provides near real-time thermal imagery and is capable of detecting hot spot in two different thermal bands. The combination of two bands is used as a criterion to identify hot spot as real fire (Greenfield et al. 2003). National INFRARED Operations (NIROP) platforms are equipped with thermal imaging Phoenix line scanner systems with two thermal infrared detectors in MWIR and TIR bands. Using navigation instruments, manned platform scans over active fire areas throughout the United States during the night and collects data. Infrared mapping is then built by receiving near real-time imagery on the ground and spotting heat source using dual band detection algorithms (Greenfield et al. 2003). Figure 1 shows an IR image of the burning area. Pixels marked as red exceed the defined fire detection threshold, surrounding by black pixel as hot areas and gray-scale thermal background image. AMS is a 16-channel wildfire scanner, compatible to both manned and UAS platform operations, in the range of visible, IR, MIR, and TIR spectral channels. The data is processed on board of the platform and multispectral data is analyzed to reduce false positives (Ambrosia et al. 2011). Figure 2 illustrates the image of the AMS on board of a UAS of a fire in San Diego County in 2011. 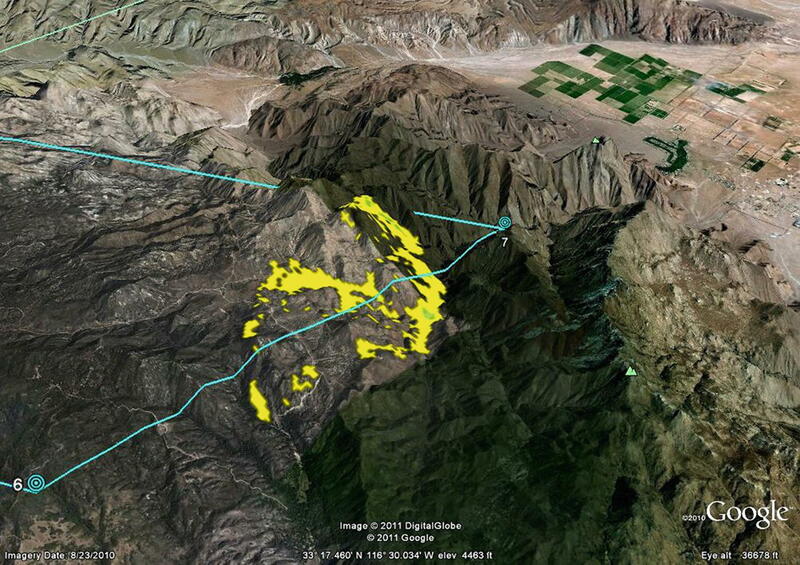 Infrared imagery overlaid on a Google Earth map and marked the hot spot in yellow. The blue lines indicate the approximate flight path. Airborne sensor platforms for wildfire observation are designed using a mixture of spectral ranges depending on the specific fire characteristics. Airborne-based sensors are mostly equipped with thermal infrared imaging with perimeter mapping or visual fire detection (Allison et al. 2016). Using infrared thermography make it possible to measure the fire energy environment across time and space. An example is the spatial and temporal analysis of LWIR fire data from the Prescribed Fire Combustion and Atmospheric Dynamics Research Experiments, (RxCADRE), which investigates the use of LWIR-sensitive band in determining fire patterns. Three different cameras capture thermal data at two different resolutions in nadir and oblique measurements (O’Brien et al. 2015). Fire radiative power (FRP, in W), using the Stefan-Boltzmann law for a gray body emitter, is used to quantify the biomass consumption. The radiant component of the energy released by the fire is quantified by measuring fire radiative energy (FRE, in Joules) (Kaufman et al. 1996). Total fire radiative energy density (FRED) is calculated for the areas recorded by the oblique LWIR camera. where i indicates time step and t is the measurement frequency (O’Brien et al. 2015). A promising coincidence of FRP and total FRE has been achieved from two different perspectives in forested vs. nonforested areas. Despite the variability of FRP and total FRE in oblique and nadir imagery, the results are comparable, considering the different spatial resolution. Camera movement, pixel distortion, distance of the super highly instrumented plots (SHIPS) from the oblique instrument platform, and absorption of radiant energy by intervening atmosphere are some common causes of the discrepancies. LWIR imagery captures a wider range of the combustion environment in comparison to visual imagery. Sensors in visible range spectrum are widely used due to the low cost, high resolution, and advanced image processing algorithms available for fire detection. One promising implementation of image processing methods is the use of color indices for wildland fire detection. 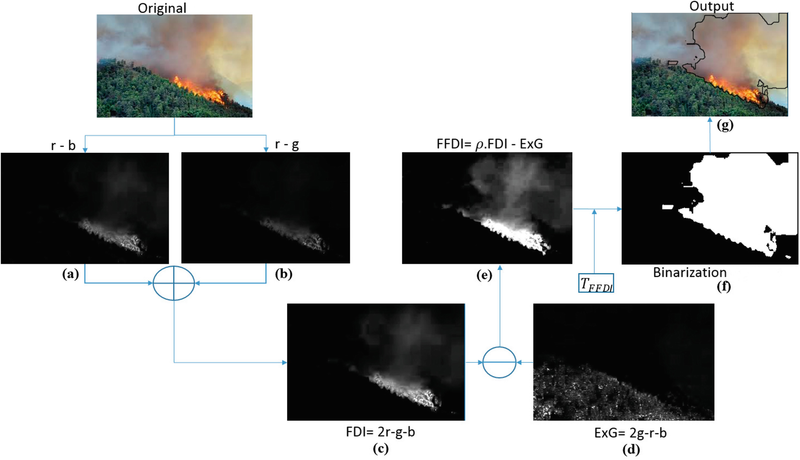 Using three components in RGB channels, different indices for fire events are defined using simple arithmetic operations. One or multiple regions of interests (ROIs) are extracted by setting a threshold on defined indices. Figure 3 shows an example of the wildfire detection process using color indices. In case of a flame with reddish orange pixels, the values of the corresponding color channels are lighter. The indices are assigned by weighting the red channel and representing it brighter than green and blue channels, known as Fire Detection Index (FDI). In this way, flame pixels are extracted with the assumption that there are no similar colors in the environment. FDI image is calculated and presented in Fig. 3c, by subtracting the blue and green component from the red channel (Fig. 3a, b). In this case, the flame portion is extracted. As a matter of fact, since flame pixels are not always visible far away from the observer, it is crucial to include smoke pixels with their white-grayish color tones, with almost equal values in red, green, and blue channels, as an extra index. To reduce false ROI classifications, the vegetation areas can also be attenuated by enhancing green color defined as Excess Green (ExG) index (Fig. 3d) for plant classification (Woebbecke et al. 1995). In this way, color pixels in fire areas are enhanced and vegetation parts in the image diminished. Finally, Forest Fire Detection Index (FFDI) is defined by subtracting vegetation index (ExG) from weighted FDI (Fig. 3e). The weighting parameter ρ controls the flame and smoke pixel extraction. Using a proper threshold, the resulted image is going through binarization process and labelling (Fig. 3f, g) (Cruz et al. 2016). To reduce the false positive alarms, a combination of spectral ranges is used as input to the multispectral algorithms. Other than the mentioned thermal remote sensing, visible and near infrared wavelength range contains information on trace elements, mainly Potassium (K) emission from vegetation during the process of flame combustion. Using an airborne hyperspectral imagery (HYPER-SIM.GA), the magnitude of the K emission signature is quantified using band differencing of the relevant spectral signals (Amici et al. 2011).